From the 11th century until 1769, a castle stood on this site. Then a new owner, the king’s treasurer René Testard de Bournais, tore the castle down and built a new palace in its place. It was spared during the French Revolution, and a succession of aristocratic families owned it until perfumer François Coty bought the estate in 1912. Some travelers find a special joy in staying in charming little inns, while others travel in the grand manner of visiting royalty. The Château d’Artigny suits this second group perfectly. Part of the fun of staying here is exploring all the little reminders of past excess: the cold-meat storage area was once where Mme Coty stored her furs; the kitchen was placed upstairs so ascending food smells would not “corrupt” sensitive noses used for sniffing perfumes. If a splurge is within the budget, opt for a room inside the château with a view. Montbazon is 12 km south of Tours. The château is just west of Montbazon on D-17. You’ll drive through acres (hectares if you will) of dense forest and park before this magical white château rises before you. Famed perfumer François Coty spared little expense while constructing his perfect cream-puff palace, as is evidenced in the massive polished limestone staircase, brass-inlaid marble floors, and grand ballroom. A cupola overhead with a trompe l’oeil fresco depicts a scene from the château’s fun-filled past. The guest rooms furnished in period style are by far the most interesting. Some are small; others are spacious with high ceilings. 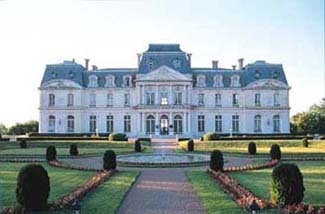 Outside the château, an exact but unfinished replica of Louis XIV’s chapel at Versailles is now the Pavillon d’Ariane, which also contains several guest rooms. 600 meters away from the château is a hunting lodge, and 800 meters away, along the Indre riverbank, is the Port-Moulin, both of which contain less formal rooms. A choice of two dining rooms (expensive) offer regional cuisine, accompanied by a fine selection of Loire wines.